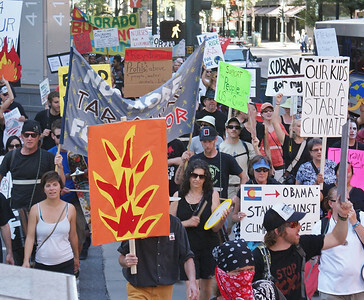 Large group of KXL pipeline protesters with signs march down city sidewalk. 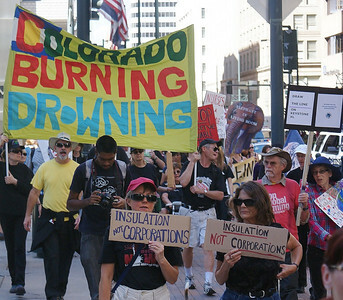 Long line of KXL pipeline protesters march down city sidewalk with signs and large 350.org banner. 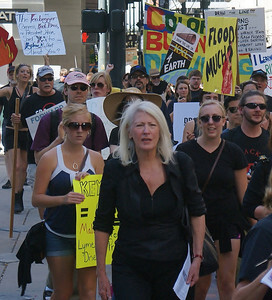 Woman dressed in black marching in KXL pipeline demonstration, large number of marchers with signs, behind her. 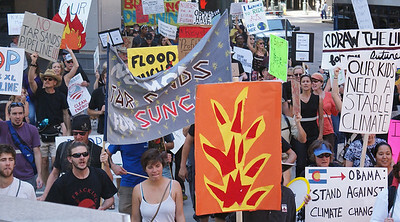 Woman with raised fist wearing a 350.org t-shirt, marching with other KXL pipeline protesters, large banner behind them. 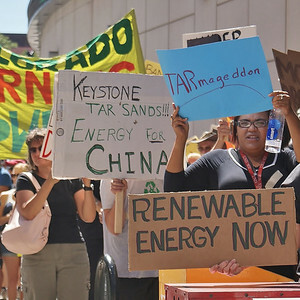 Two women with signs marching at the fron of a KXL pipeline protest, other marchers and large banner behind them. 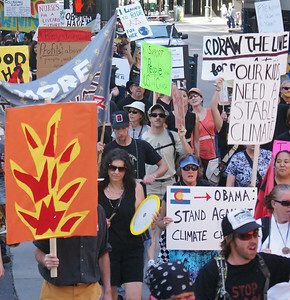 Large group of protesters carrying signs at KXL pipeline march. 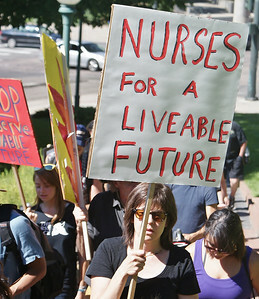 Nurse carrying sign in KXL pipeline protest march. 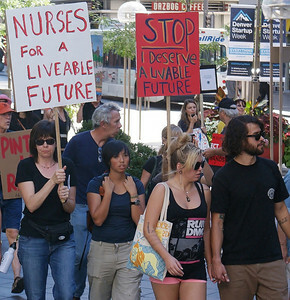 Nurse displays sign at KXL pipeline protest. 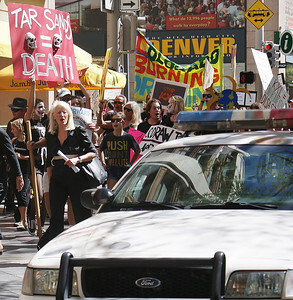 KXL pipeline protesters with signs, march on city sidewalk. 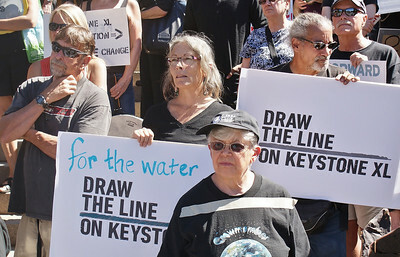 senior man and woman holding signs at KXL pipeline demonstration. 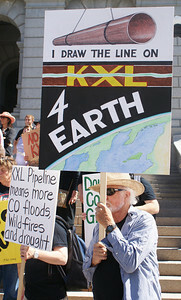 Senior man carrys sign while marching at KXL pipeline protest. 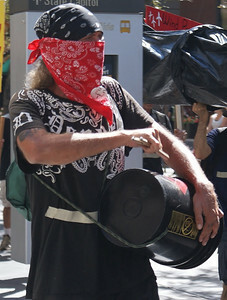 Senior man holding anti KXL pipeline sign at demonstration. 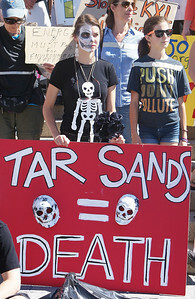 Young woman with skeleton make-up and t-shirt holding sign about tar sands. 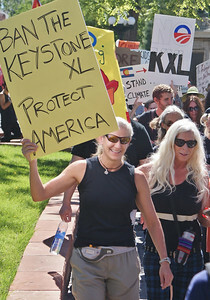 Two young woman with skeleton make-up at KXL pipeline demonstration. 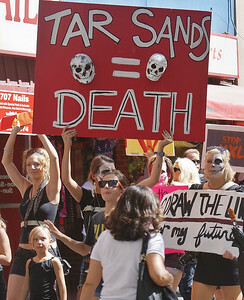 Young woman with skeleton make-up holding sign about tar sands while marching at KXL pipeline protest. 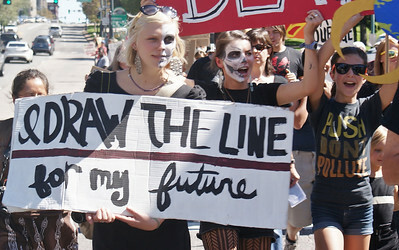 Young woaman with skeleton make-up marches with others holding signs at KXL pipeline demonstration. 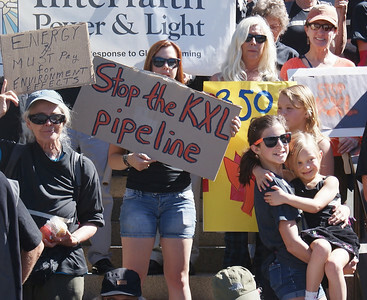 Group of senior women and young girls holding signs at KXL pipeline protest. 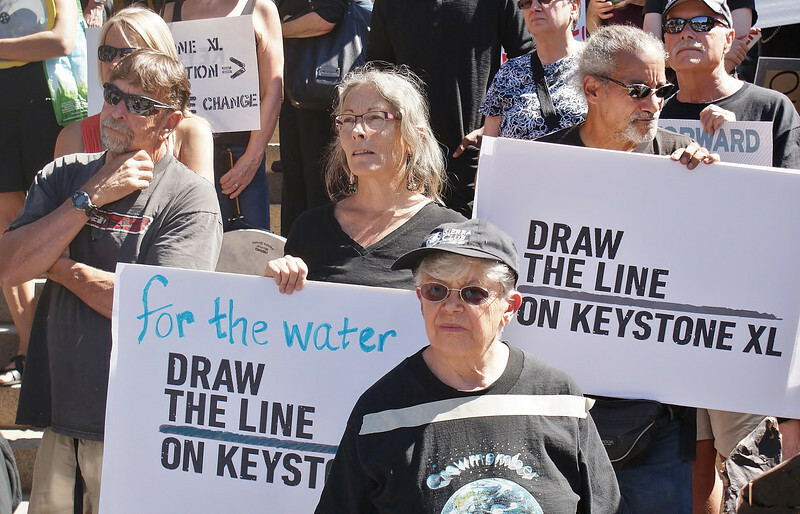 Group of men and women holding signs at KXL pipeline protest. 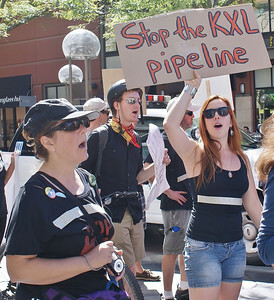 Young women chant at KXL pipeline protest. 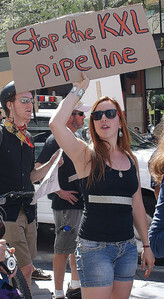 Young woman raising sign while chanting at KXL pipeline demonstration. 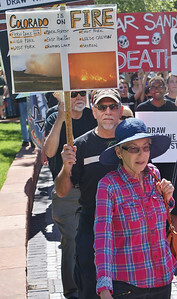 Man carrying sign about climate change at KXL pipeline protest. 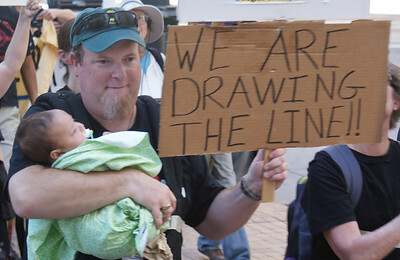 Father holding sign, carrying infant in arms, marching at KXL pipeline protest. 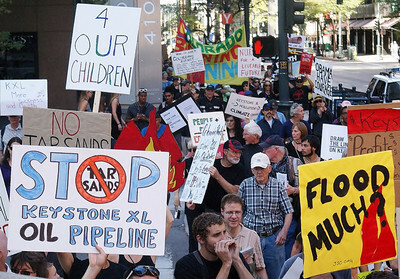 Young girl, standing, holding "Not In My Future" sign at KXL pipeline protest. 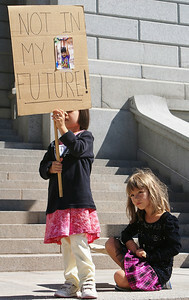 Young girl sitting on steps holding "Not In My Future" sign at KXL pipeline demonstration. 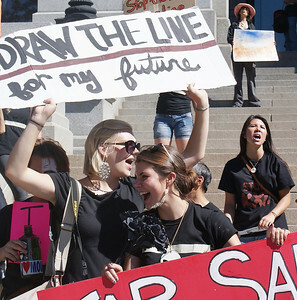 Two young girls at KXL pipeline protest, one holding " Not In My Future" sign while other watches. 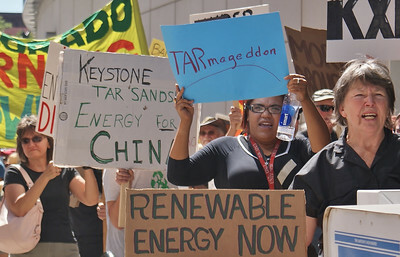 Protesters at KXL pipeline demonstration hold signs about tar sands. and renewable energy. 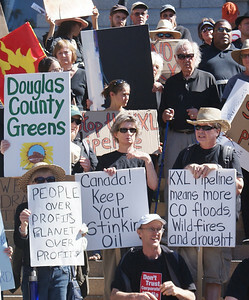 Large group of people holding signs at KXL pipeline protest. 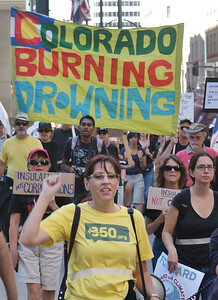 Women wearing anti fracking shirt, carrying "Flood Much?" 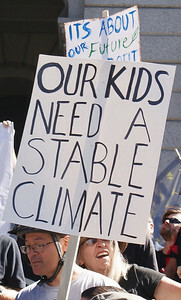 sign at KXL pipeline demonstration. 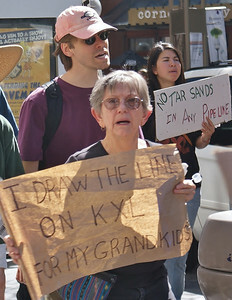 Woman with sign about children at KXL pipeline protest. 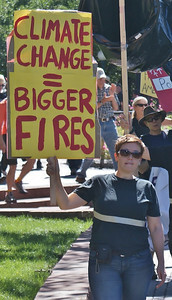 Young woman at KXL pipeline protest holding sign, "Climate Change = Bigger Fires". 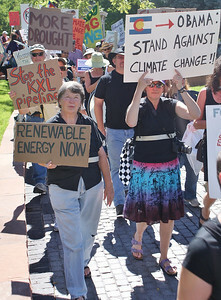 Woman in KXL pipeline protest march carrying sign about renewable energy. 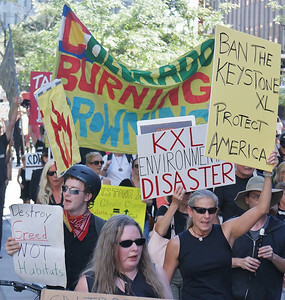 Woman holding sign while marching at KXL pipeline protest, large number of marchers behind her. Young man with sign about "injustice" marching at KXL pipeline protest. 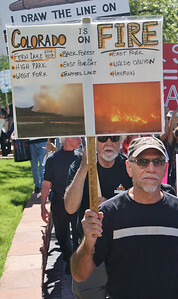 Man with sign about Colorado fires, marching with others at KXL pipeline protest.